I am so incredibly thankful for all of you and for the time you take to comment and read my blog! Thank you so much for your continued support! I love having this fabulous space to connect with other teachers and bloggers all over the world, who I never would have “met” if it hadn’t been for blogging! I made a Thankful printable to put up for our family Thanksgiving feast… Click on the picture to get it for free! I am thankful for all of you!! I know that many of you still have to go back to school for a few days next week, so I have a couple things you may want to stop by my shop to pick up! 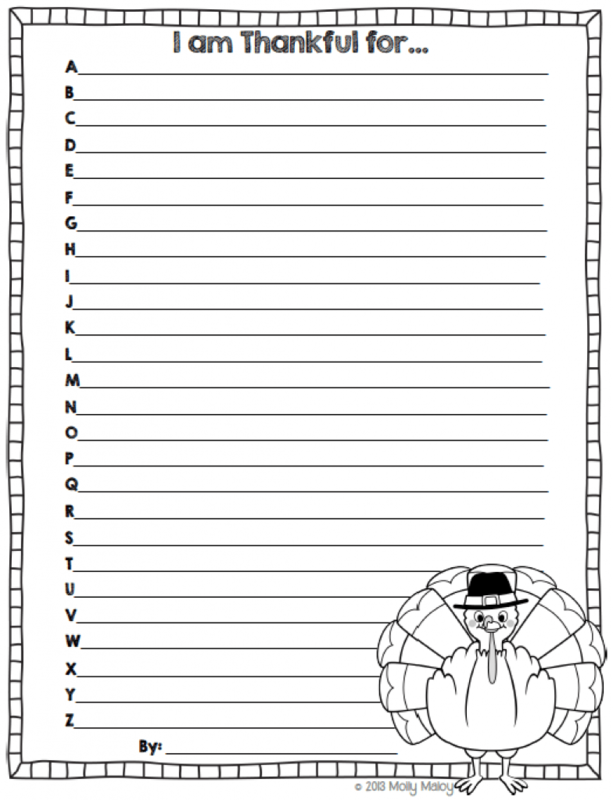 This first one is a freebie that will get your kids thinking of all the things they are thankful for from A-Z! I tell my kids they get double points if they think of something with multiple beginning letters… like Kit Kats or Mary’s Meals (an awesome non-profit my students are raising money for this year). I also have Thanksgiving Math Centers that review capacity, subtracting across zero, missing factor problems, and adding and subtracting decimals. It is 20% off through this Tuesday 11/25! Are you off all week or do you go back for a couple days? Thanks for your sweet comment! That is such a great thing to hear! Hope you had a wonderful Thanksgiving!